This short piece is my attempt to increase awareness about problems facing many of our trout waters, in my region as well as many around the globe. In our hemisphere, high summer water temperatures stress the local trout fisheries and should be a sign to concerned anglers that it is time to leave the stream for another day. Independent guides and fly shops who book trips should be ardent advocates for keeping streams healthy. But often they’re not. Stewards of the river or pillagers was a thought the other day with the amount of pressure guides place on a limitied resource. 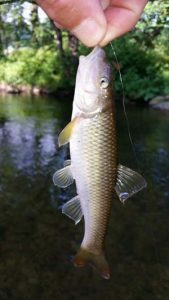 Conflicts arise because the summer tourist season occurs when most of our trout streams become stressed. July and August for trout fishing in Western NC are the off season! When the early morning water temps approach 70 F, it is best to look for something else. Warm water fishing for smallmouth bass, perch, bluegill, is a better choice. Carp is one of my favorite species to target during summer. Shops and outfitters who tell you differently are profiteers, not stewards of the resource. They look at the short-term since even they know that trout caught in 70+ F water have a very dicey chance of survival. These profiteers actually hurt the resources they claim to love and protect! This becomes an ethical decision for those customers that are hell-bent on trying to catch a mountain trout during the wrong season! 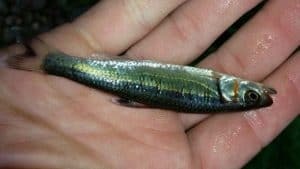 This might provide opportunities like targeting Chub (above pic) for learning nymphing techniques through the middle of the day. Chub provide plenty of subtle strikes just like trout! Here is a trophy from a few days ago on one of my favorite streams in the Great Smoky Mountains National Park with my 10-year-old son. Excessive fishing pressure is an increasing problem on many delayed harvest trout streams, due mostly to the increasing number of new fly fishers as well as an excess of fishing guides and outfitters. There is a big difference between how much room to leave fellow anglers on a Delayed Harvest stream versus a wild stream. The wild stream requires perhaps a mile or more out of sight. On the Delayed Harvest stream that may be only a 30 feet. Delayed-harvest waters receive many numbers of trout that tend to stay together when they are first stocked. Often, local guides work when and where they can, through shops or other outfitters. Part of the issue is that these guides’ experience levels are all over the place. 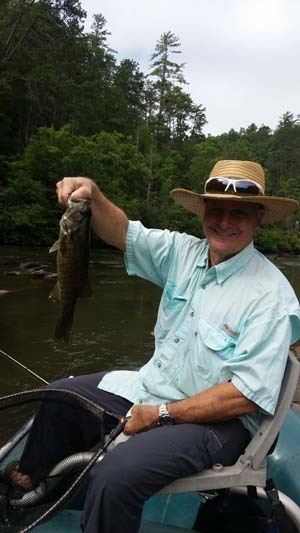 In my region, The Smoky Mountains, there are too many fishing guides. An Ozark term my grandfather used to say is “the market is glutted.” Many shops and outfitters just look for bodies to fill slots on their books, regardless of experience and knowledge of the area. In my area, guide prices range from $40 to well over $500 for the same trip on the same water. The difference of what you come away with learning and also catching is quite obvious if you really do your homework first. In fly fishing especially, you get what you pay for. It is all about your intrinsic value! As a beginner fly fisher I believe it is even more important to establish a strong foundation on which you may grow into the sport. But, in my opinion, the Southeast is a circus show, with the exception of a few quality shops. People pay hard-earned money for a quality trip. The older I get, the more twisted our sport seems to be growing. Is this positive growth for future generations? Blowing up social media pages constantly with “controlled stocked” fish selfies as opposed to wild habitat for trout? It is kind of like the movie the “Field of Dreams” in that if you offer it they will come. I am about teaching and educating the sport of all things fly fishing. How to learn to get a drift, read water, fly casting, and a host of other things. Through education and building a foundation you can prepare yourself to fish exciting and diverse waters globally! Another important question –, regardless of skill, teaching ability, qualifications, certifications, does it even matter to the client? Is it only about who is the cheapest price overall? Is it all about hatchery mutants that are plentiful? So this Disney approach to the sport is something that will take me a while to get my head around. I have pushed hard for very high-quality trips for close to thirty five years now.